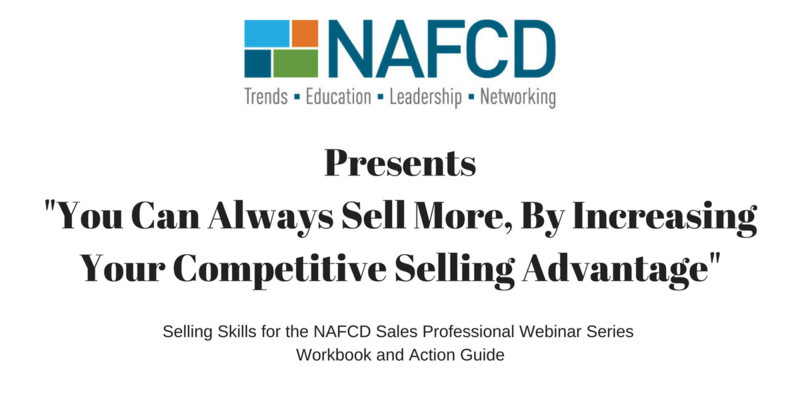 Specifically developed for you, the NAFCD member, this advanced distribution sales webinar series will help you and your team increase your competitive selling advantage and overall selling success. Recorded as four thirty-minute information-intensive “Voice over PowerPoint” programs, this series will help even your experienced sales pros increase their selling control and persuasive positioning. This program has been designed to be utilized as either a video learning program to be viewed at your desk, or as an audio podcast to be listened to while driving or exercising. A detailed program workbook/action guide is also included with this program. Download the program workbook. Please note: The 4-part distribution sales webinar series is available to NAFCD members only. In addition to an overview of our entire four-session program, you will also learn about the three profound shifts in selling that are disrupting today’s buyer behaviors. We will also talk about the selling skills necessary for selling success today, how weak most experienced reps are with their multiple-call tactical planning and strategic messaging and positioning, and how you can best strengthen these skills within your entire sales team. You will learn how to strengthen your strategic communications of your uniqueness and competitive advantage. You will also learn how to effectively sell against low price as well as the real reasons buyers buy when given competitive choices. You will learn the tactical structures to gain more control of your buyers by thinking and planning more moves ahead. Selling tools to be learned include the “Identify to Close” multiple stepped selling process, how to successfully run a full year of selling campaigns for your existing customers and how to get “Higher, Wider and Deeper” within your most important accounts. In this final segment you will learn how to think and plan multiple moves ahead with your most important accounts. You will also learn how to conduct account planning with your most important accounts. How to best utilize a special four-page account planning form (included in your program workbook/action guide) will be explained. This segment also includes ideas to help your sales manager effectively lead you thorough this account planning process. You and your team will get the greatest return on your financial investment in this program if you, as your team’s coach and leader, guide your team through this training process. As an added bonus to help your entire team gain skills and insight from this training, a special thirty-minute video segment is included to help you coach and guide your team through this program’s proven concepts. You will learn the best coaching language and approach to help your people get the most out of this program. You will also learn the best questions to ask as your team’s coach and guide as you lead your team through these training modules. Jim Pancero from Dallas, TX is a long-term friend and resource of NAFCD having extensively researched and worked within our industry. He has also successfully shared his proven concepts at several of our past conferences. Jim has spent over 37 years as a sales and sales leadership speaker, trainer and consultant, helping services, distribution and equipment manufacturers to increase their competitive advantage as well as strengthen their sales leadership skills. You can learn more about Jim at www.pancero.com.